We’ve reached the halfway point. And no, Chris Petersen has not named a starting quarterback. That isn’t to say there’s nothing to report on Washington’s most highly scrutinized position competition. In the six (of eight total) spring practices the media have been allowed to attend, junior Jacob Eason and sophomore Jake Haener have split the vast majority of starting reps. Haener has been simultaneously the most accurate and self-destructive, throwing and running for a touchdown apiece while serving up three interceptions. Eason, meanwhile, has thrown two touchdowns — both in the same practice — without committing a turnover, but his renowned right arm has also been more erratic than the 6-foot-6 junior would probably like. So, yes, when it comes to the quarterback competition, don’t expect anything to be decided in the spring. But through eight April practices, other storylines — and standouts — have emerged for UW as well. Here are six (or more?) Huskies who have stood out early in the spring. Maybe this is all just addition by subtraction. After all, three of Washington’s most experienced wide receivers — seniors Aaron Fuller and Quinten Pounds and junior Ty Jones — are out of action this spring. But a few unfortunate injuries have also yielded opportunities … and Terrell Bynum and Austin Osborne have taken advantage more than most. Bynum — a 6-foot-1, 198-pound sophomore — has yet to catch a pass in his first two seasons at UW, but he has lined up with the starters (opposite senior Andre Baccellia) in every practice nonetheless. Bynum also made perhaps the most impactful play of the spring so far, sprinting past fellow Long Beach, Calif., native Keith Taylor and hauling in a deep pass from Eason along the sideline for a long score. The former St. John Bosco High School standout possesses both the frame to win jump balls and the speed to breeze by defensive backs, as evidenced by his 4.48-second 40-yard dash at the Husky Combine. But does he have the confidence to finally put it all together? The same question can be directed at Osborne. A 6-2, 198-pound wide receiver, Osborne was ranked as a four-star prospect out of Mission Viejo (Calif.) High School in 2018 but failed to see the field in his freshman season. The Rancho Santa Margarita, Calif., native has been perhaps UW’s most active wideout this spring, with the highlight being a 48-yard touchdown strike in frigid temperatures from Haener. Granted, another highly touted redshirt-freshman receiver — Marquis Spiker — has had a few memorable moments as well. But Osborne seems to have paved a more direct path to immediate playing time. It’s also worth noting senior Chico McClatcher has been consistently impressive in his return to the field. But will either Bynum or Osborne make a significant impact once Fuller, Pounds and Jones return (and four-star freshman Puka Nacua arrives this summer)? That remains to be seen. Still, they’ve done enough this spring to plant themselves in the conversation. You already know what junior Hunter Bryant is capable of when he’s healthy. Well, guess what? He’s healthy. The 6-2, 241-pound Eastside Catholic alum — who missed the first nine games last season with a knee injury — has played like it this spring, providing a reliable, enticing target in the Huskies’ starting rotation. Eason, in particular, has frequently targeted his dynamic tight end. For good reason, too. Bryant has been a handful. “I’ve definitely been getting work with all of our quarterbacks,” Bryant said this week. “So I want them to know if they ever get in a tough situation, they can just throw it up and I’m going to come down with the ball no matter where I’m at. Bryant — who has caught 33 passes for 569 yards and two touchdowns in 14 career games — and 6-5 sophomore Cade Otton should be featured heavily in the Huskies’ offense this fall, serving as a security valve and red-zone mismatch for whoever ultimately lines up under center. We entered the spring expecting a competition for the starting right-tackle spot. There has not been a competition. From the first practice on, it has been Jared Hilbers’ job. And that’s not extraordinarily surprising, considering the 6-7, 305-pound senior started 11 games at left tackle for the injured Trey Adams last fall. But switching sides is a more difficult proposition than it sounds, and it was expected that 6-6 sophomore Henry Bainivalu would at least provide some healthy competition along the way. Maybe he still will. Maybe that’s already happening behind the scenes. But to this point, at least, the only offensive-line starter who has consistently shared first-team reps is senior Nick Harris — and that’s because the 302-pound center has been limited with an injury. It’s worth cautioning, of course, that a lot can — and will — change between now and Aug. 31. That certainly could include the offensive-line rotation. But through eight practices in April, Hilbers has been a mainstay on the right side of the line. He’s one of five offensive linemen with significant starting experience. And while the quarterback position may be unproven, its protection is anything but. Levi Onwuzurike is a proven commodity on the Washington defensive line. But that’s the beginning and end of the list. With Greg Gaines, Jaylen Johnson and Shane Bowman all gone, Ikaika Malloe is suddenly searching for answers at the point of attack on defense. He might have found a 6-2, 322-pound answer in Sam Taimani. The redshirt freshman from Salt Lake City has made the most of his infrequent starting reps this spring, showcasing a penchant for penetrating the opposing offensive line. Granted, it’s a crowded competition, with John Clark, Benning Potoa’e, Josiah Bronson, Tuli Letuligasenoa and Jason Scrempos all working into the rotation. Each have shown flashes. Clark and Potoa’e have both recorded multiple sacks this spring, Letuligasenoa is another powerful, potentially productive redshirt freshman and Bronson turned in perhaps his best practice Monday. Three more freshmen — Jacob Bandes (who enrolled early but is out this spring with an injury), Faatui Tuitele and Noa Ngalu — will also join the fray this summer. Whether the answer is Taimani or someone else — and if Malloe has his way, it’ll be a combination of all of them — the goal is to improve upon a defensive line that finished 15th in rushing defense (116.1 yards per game) and 21st in opposing yards per carry (3.53) in 2018. Elijah Molden has already produced. Now, it’s time to consistently start. The 5-10, 190-pound junior defensive back started just two games in his first two seasons but contributed 48 tackles and six passes defended in 27 career games. The 2018 All-Pac-12 second-team selection would have undoubtedly already starred in most other college secondaries. But in terms of depth, those secondaries can’t compare with the group Jimmy Lake has recruited to UW. Now, it appears to be Molden’s time to step into the starting rotation. The junior-to-be started the spring as one of Washington’s first-team cornerbacks, opposite fellow junior Keith Taylor. And when senior Myles Bryant shifted back to safety, Molden moved inside to his more familiar nickelback position. Regardless of where he plays, expect Molden to start — and for good reason. Take the second practice of the spring, when a pass was tipped into the air, Molden leaped into traffic to snag it and then took off in the opposite direction. Fans will almost certainly see more of that this fall, and not by accident. Cameron Williams has been on campus for fewer than four months. Not that you’d know it when you watch him practice. Williams — a 6-0, 185-pound early enrollee freshman — kicked off the spring as a second-team safety, beside converted wide receiver Alex Cook. Unsurprisingly, he has yet to crack the starting rotation, with a pair of more experienced options — senior Myles Bryant and junior Brandon McKinney — both standing in his way. But if you listen to Petersen or Lake, it’s not hard to imagine Williams contributing immediately this fall. “There’s been nobody that I’ve been more impressed with than Cam Williams,” Petersen said last week. 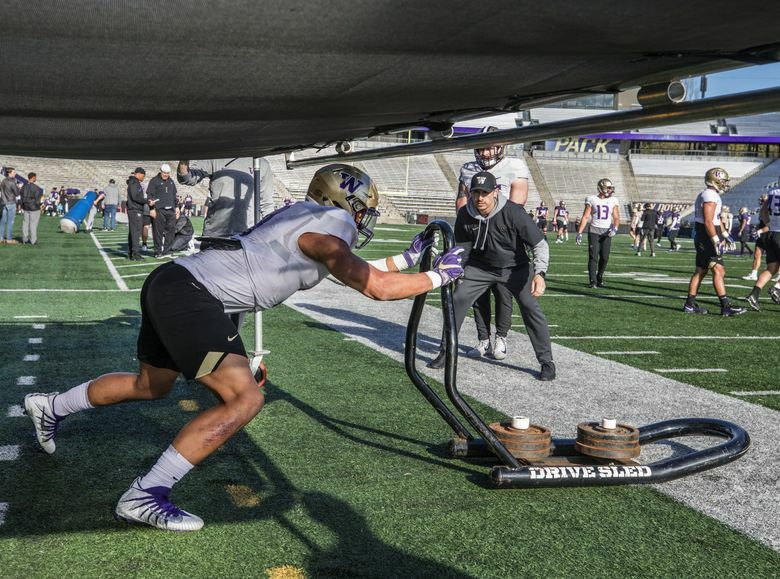 Without the likes of Taylor Rapp and JoJo McIntosh, Washington has had a relatively thin competition at safety this spring, and that has resulted in more reps for Williams. He took advantage Monday, shadowing Osborne on a crossing route and intercepting Haener on an overthrow in a scrimmage drill. Bryant, McKinney, Cook and Williams — and when he’s fully cleared, redshirt freshman Julius Irvin — will all continue to compete, and four-star freshman Asa Turner will join the fun this fall. And it’s true, Petersen always says you can’t win the spring. But if you could, Williams would be winning it.